Analytical expressions for the symbol error rate (SER) of MIMO systems are important from both design and analysis point of views. This paper derives exact and easy to evaluate analytical expression for the SER of an orthogonal space-time block coded (OSTBC) MIMO system with spatially correlated antennas, in which the channel signal propagation suffers from a degenerative effect known as a keyhole. These expressions are valid for complex valued correlations between antenna elements. Numerical results obtained by simulations are presented to confirm the validity of the analytical SER expressions for several multilevel modulation schemes. Subsequently, a procedure for designing a linear precoder which exploits the knowledge of the channel correlation matrix at the transmitter to enhance the performance of the above system is given. To this end, the exact SER expression is minimized by using a gradient descent algorithm. To demonstrate the performance improvements achievable with the proposed precoder, numerical results obtained in several design examples are presented and compared. The benefits of using multiple transmit and receive antennas and space-time coding for wireless communication are well known . In principle, the capacity of such multiple-input multiple-output (MIMO) channel can be much higher than a single-input, single-output (SISO) channel. The capacity of a MIMO channel is maximum when each transmit and receive antenna pair forms a statistically independent transmission path, a condition which is nearly met in a rich scattering environment. Space-time codes (STC) can be used to exploit the spatial diversity available in such a channel to realize high-rate data transmission . However, in realistic situations, the channel capacity is degraded by spatial correlations at the transmitting and/or receiving antenna arrays, due to, for example, insufficient spacing of antenna elements in the arrays, the existence of few dominant scatters, or small AOA spreading . Furthermore, recent studies, both theoretical and experimental, have shown that, in addition to antenna correlation, the MIMO channel capacity can also be decreased by so-called keyhole effects in wave propagation [3, 4]. In particular, a keyhole effect reduces the rank of the MIMO channel matrix to one, even in the absence of any spatial correlation in the channel . In a keyhole MIMO channel, the signals from the transmit antenna array are constrained by the physical structure of the propagation environment to pass through a keyhole before reaching the receive antenna array (Figure 1(a)). Such keyhole effects have been observed in both indoor and outdoor propagation environments [5, 6]. (a) Keyhole MIMO channel, (b) Block diagram of the system under consideration. In previous work, the capacity of MIMO keyhole channels is studied in [3, 7–9]. In , expressions for the exact symbol error rate (SER) of orthogonal space-time block codes (OSTBC) over a double Rayleigh fading keyhole channel are derived for -PSK and -QAM modulation schemes. In a subsequent work , similar analysis is also carried out for keyhole channels with Nakagami- fading. In another related work,  derives expressions for the pairwise error probability (PEP) of MIMO systems with keyhole channels. However, in [7, 10, 11], the channel is assumed to be spatially uncorrelated. Similar analysis for MIMO keyhole channels with spatial correlations has not been reported so far. It is well known that if the channel correlation matrix is known at the transmitter (e.g., as channel side information (CSI)), a linear precoder matched to the channel correlation structure can be used at the MIMO channel input to improve the system performance (see, e.g., [12–16]). However, the aforementioned work assumes Rayleigh or Ricean fading and is not applicable to double Rayleigh fading as in the case of channels with keyholes. Formally, a keyhole MIMO channel can be modeled by a matrix which is the outer product of two complex Gaussian vectors . This implies that each coefficient in the channel matrix is a product of two independent complex Gaussian variables (and hence the name double Rayleigh fading). Since keyhole effects lead to the degeneration of the channel matrix [3, 4], it is particularly important to exploit CSI available at the transmitter using a properly designed precoder to enhance the MIMO system performance. In contrast to previous work, we consider in this paper the SER analysis and the design of linear precoders which minimize the average SER of double Rayleigh fading MIMO channels with spatial correlations. More specifically, we derive easy, to evaluate, exact analytical expressions for the average SER of systems with -PSK, -PAM, and -QAM signaling and maximum likelihood (ML) detection. These closed-form SER expressions are useful in performance analysis of such systems and can be easily evaluated with computing software, using readily available functions. Numerical results are presented in this paper to confirm that our analytical expressions agree with those obtained by simulation of the OSTBC-MIMO system. Based on the analytical expressions for SER, we then present a design of linear precoders which minimize the average SER by exploiting the knowledge of the channel correlation matrix (available at the transmitter either as prior knowledge or via a feedback channel from the receiver), under a constraint on the total average transmitted power. In our formulation, the antenna correlations are allowed to be complex valued . In the general case, we consider it is difficult to find a closed-form solution for the minimum SER (MSER) precoder. As such, the MSER precoder matrix is found by a constrained gradient descent minimization method, based on the derivatives of the average SER. Experimental results are presented to demonstrate the performance improvements achieved by the proposed MSER precoder. In these experiments, MIMO keyhole channels with both real and complex correlation matrices have been considered. The expressions and the optimal precoder design derived in this paper are novel in the following aspects. Different to , the SER expression derived in this paper applies to MIMO keyhole channels with spatial correlations at both transmit and receive antennas. While the SER expressions in , which apply only to uncorrelated channels, do not generalize to our case, we show that in the absence of spatial correlations the SER expressions we derive reduce to those in . Note that, for the uncorrelated channel considered in , the precoding problem we consider is not relevant. Also, different to [14, 15], the SER expressions and the optimal precoders derived in this paper account for the keyhole effect, that is, each channel coefficient is a product of two complex Gaussian random variables. While there is no direct relationship between these expressions, they correspond to two extreme cases of a double scattering channel with scatterers . In particular, when , the channel exhibits the keyhole effect considered in this paper. When , the MIMO channel is the single-scattering case considered in [14, 15]. It should be noted that neither the results in this paper nor those in [14, 15] readily generalize to the case . The rest of this paper is organized as follows. Section 2 describes the keyhole channel model and the OSTBC-MIMO system model under consideration. Section 3 derives the SER expressions for this system, where -PSK, -PAM, and -QAM modulation schemes are considered. Section 4 then presents an algorithm for designing an MSER linear precoder for the system. In Section 5, numerical results are presented to demonstrate the accuracy of the given SER expressions and the performance gains achievable with the proposed precoder designs. Finally, concluding remarks are given in Section 6. Some proofs are provided in the appendices. is matrix stack operator, is matrix transpose, is Hermitian operation, is complex conjugate, denotes the trace of a matrix, is Frobenius norm, ( is vector norm), denotes the Kronecker product, denotes identity matrix, and defines new symbols. The gain matrix of a double Rayleigh fading keyhole MIMO channel with transmit antennas and receive antennas can be represented by the outer product of two independent complex Gaussian vectors (size and (size representing transmit and receive Rayleigh fading, respectively, , that is, . However, each vector is assumed to be correlated so that and , where is the transmit antenna correlation matrix, is the receive antenna correlation matrix, and and are independent identically distributed (iid) complex Gaussian vectors of sizes and respectively, (here, and are the unique square roots of Hermitian positive semidefinite matrices and , resp., ). Note that each element of is a product of two independent Gaussian variables. Note also that the rank of is necessarily one. where is the average power of modulation signal set, and is a constant that depends on the particular OSTBC in use. For example, for , and for in . The codeword is transmitted through the MIMO keyhole channel whose output is a matrix , where is the complex channel noise matrix. The elements of are independent complex Gaussian variables with iid real and imaginary parts of variance . The receiver decodes channel output using a ML detector. It is assumed that the channel matrix remains constant for the duration of a codeword (quasi-static channel), and that the receiver has the knowledge of and to be used in ML decoding. While is not known to the transmitter, the antenna correlation matrices and are assumed to be known. This integral is readily available as a built-in function in software packages such as Matlab and Mathematica. Given this result, the MGF of the output SNR, can be obtained as . where is the confluent hypergeometric function [26, (9.211-4)], is the gamma function, and , are partial fraction coefficients (procedures for finding which are well known). This expression can now be used to generalize the SER expressions (21)–(23). It can be shown that when for all ( ) and for all ( ), (24) reduces to (16). Other interesting cases are when either transmit antennas or receive antennas are uncorrelated, in which case either or is the identity matrix. Also, when both and are identity matrices (no channel correlation), then it is easy to show that (24) reduces to [10, (6)]. This equation yields two positive values for for which the updated precoder in (26) satisfies the power constraint, provided that the step size is chosen sufficiently small (see Appendix B). The choice of the smaller value for out of the two possible solutions results in the proper convergence of the gradient descent algorithm (see Figure 8). In each iteration , we first find by solving (28) and then using (26). The convergence of the solution can be decided when becomes less than a prescribed threshold. In the following, we derive closed-form expressions for for different modulation schemes. In this section, we present numerical results to verify the analytical SER expressions derived in Section 3 and to demonstrate the benefit of the proposed MSER precoders. 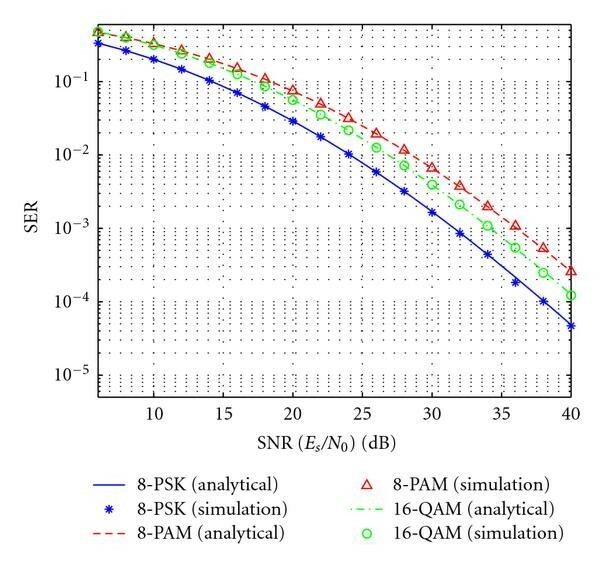 In order to confirm the analytical SER expressions derived in Section 3, we compare them with SER estimated by simulating the underlying MIMO system. While the expressions we have derived are valid for a general channel correlation matrix, we here present experimental results obtained for the case of exponential correlation model  widely used in the literature. In this case, the transmit and receive antenna correlation matrices are given by , and , where , . In our simulations, we have used . We have considered a number of different OSTBC-MIMO systems to verify the SER expressions. A typical set of examples are presented in Figsure 2 and 3 which confirm that the analytical SER computed with (21), (22), and (23) agrees very well with the values estimated by system simulation. Comparison of SER computed using analytical expressions (21), (22), and (23) with the estimates obtained by system simulation. Results obtained with a MIMO system (without precoding) based on rate 1 OSTBC (Alamouti code)  and the exponential antenna correlation model. Comparison of SER computed using analytical expressions (21), (22), and (23) with the estimates obtained by system simulation. Results obtained with a MIMO system (without precoding) based on rate 3/4 OSTBC from  and the exponential antenna correlation model. The results in Figure 2 are for a MIMO system based on the OSTBC from  (Alamouti code) for which . In this case, , , that is, rate is one. Figure 3 shows the results for a MIMO system based on the OSTBC from  for which and , , , that is, rate is 3/4. Note that no precoding has been used in these cases ( set to a scaled identity matrix). Since spatial correlation in the channel degrades the SER performance, it is also of interest to compare the SER of an OSTBC over a correlated keyhole channel with that over a keyhole channel with no spatial correlation. 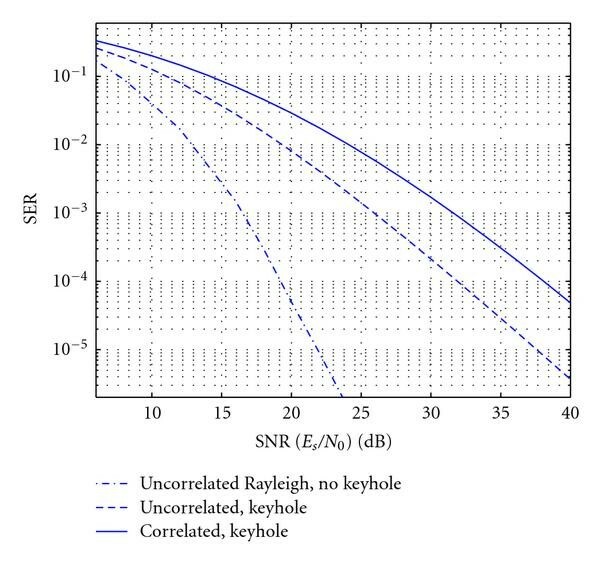 Such a comparison for the MIMO system is shown in Figure 4 which shows that the degradation of performance due to spatial correlation in the given keyhole channel can be quite significant at high SNR (exponential antenna correlation model is used). Also included here is the SER over an6 Rayleigh fading channel (no keyhole effect and no antenna correlation). In particular, these curves clearly highlight the loss of diversity (as indicated by the slope of the curves ) in the MIMO system due to the combined effect of the keyhole propagation and the antenna correlation. Performance degradation and loss of diversity due to the keyhole effect and antenna correlation in a MIMO system based on (Alamouti code) [ 19 ], 8-PSK modulation, and the exponential antenna correlation model. 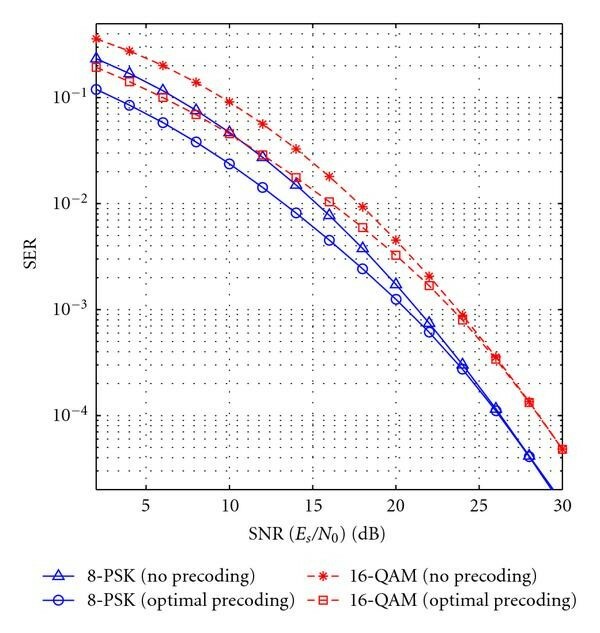 Performance improvements achieved with optimal precoding in a MIMO system based on OSTBC from [ 20 ] and the exponential channel correlation model. where is an vector and is a vector with all elements equal to zero. Then, from the discussion in [13, Section IV- A], it follows that the resulting precoding scheme is also equivalent to beamforming in the direction of . Note that if the MSER precoder matrix is known to have equal elements, it can be directly determined by using the power constraint. Performance improvements achieved with optimal precoding in a MIMO system based on OSTBC from . The transmit antenna correlation follows the exponential model while the receive antenna correlation is modeled by a general complex correlation matrix from . Note that the result in Appendix E shows the existence of multiple local minima. Since the given descent algorithm may converge to a local minimum, one can choose the best design among multiple designs obtained with random initializations for the precoder. In our experiments, the best solution obtained in this manner was comparable to the one obtained with the diagonal initialization which is the scaled (to satisfy the power constraint) identity matrix. It is also possible to use a relaxation-type algorithm in which the SNR is reduced from a higher value (for which the diagonal precoder is nearly optimal) to the desired value in steps, and to progressively optimize the precoder to each SNR value. In all our designs, the gradient descent minimization algorithm converged rapidly to a stable solution. A typical example is shown in Figure 7 which shows the convergence of both the precoder matrix and the Lagrange multiplier. Thus, this algorithm can be used to adaptively update the precoder matrix based on, for example, the estimates of the channel correlation matrix obtained via measurements. Typically, the channel correlation matrix changes much slower than the channel matrix itself and hence can be estimated periodically at the receiver and be fed back to the transmitter for adapting the precoder matrix. 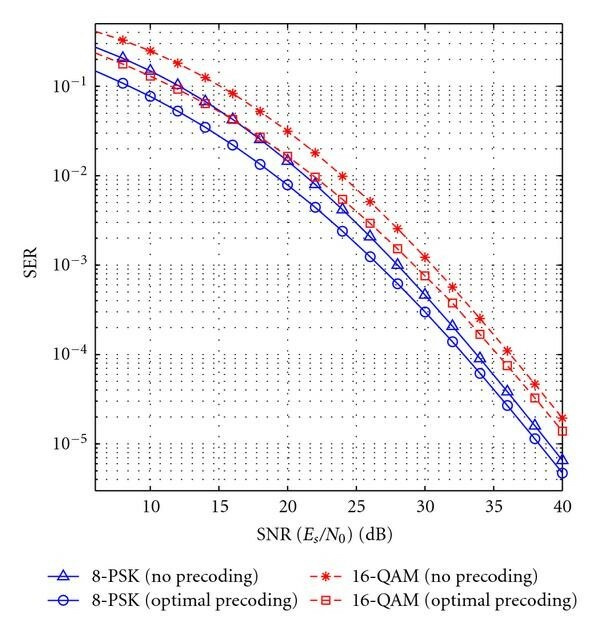 The convergence of the proposed precoder design algorithm (8-PSK system in Figure 6 and dB). Left: variation of versus iteration number; Right: variation of with iteration number. A graphical interpretation of the solutions of (28). The gradient vector depends on . Provided that the step-size is small enough, (28) yields two possible values for for which the updated precoder satisfies the power constraint. The two possible solutions for the updated precoder are given by and . The use of smaller yields the desired updated precoder for which the gradient descent converges. 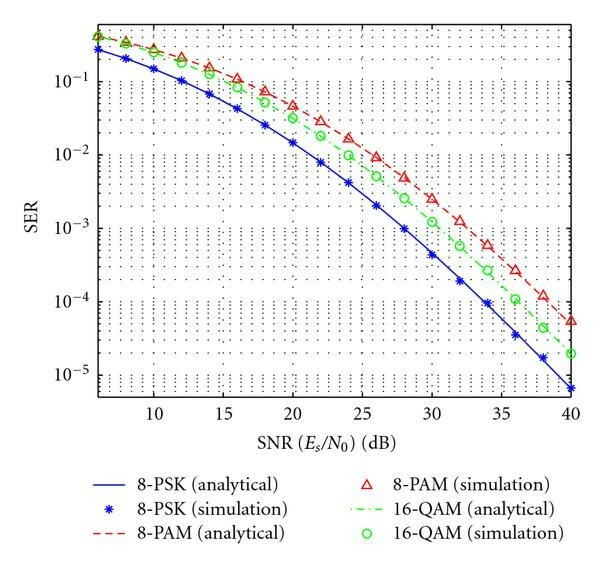 Exact analytical expressions were derived for SER of -PSK, -PAM, and -QAM modulated OSTBCs over a MIMO spatially correlated keyhole channel. A general complex correlation matrix has been assumed in the derivations. These expressions are easy to compute using numerical software and have been verified by Monte Carlo simulations. The given analytical expressions have been used to design MSER linear precoders based on the knowledge of channel correlation matrix available as CSI at the transmitter. Using simulation experiments, it has been demonstrated that the proposed MSER precoder can significantly reduce the error probability of a MIMO system operating on a fading channel degraded by a keyhole effect. An important extension to this work includes precoder design for more general multiple scattering fading channels . In particular, an interesting case is the double scattering model  (of which the keyhole channel is a special case). where , , and is the Gamma function. Specifically, by letting , and , we obtain (24). Clearly, all coefficients of (28) are real. A simplified graphical interpretation of the solution to this equation is shown in Figure 8. Note that is the updated solution for the precoder matrix, without considering the power constraint, that is, when . 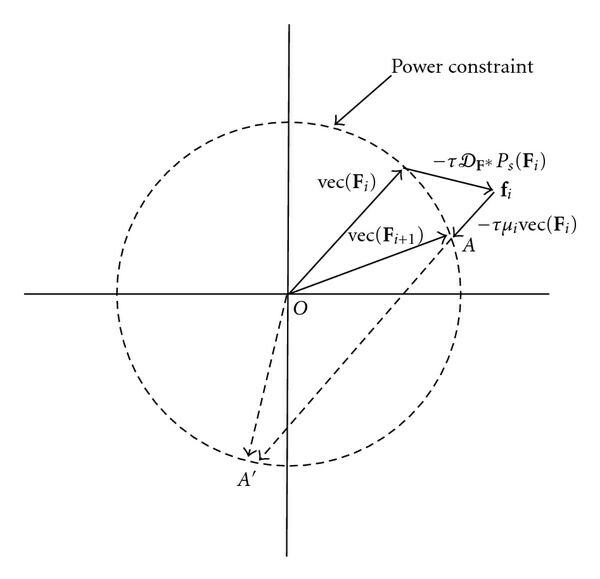 This solution satisfies the power constraint as an inequality if . In this case, the rescaling of to satisfy the power constraint will result in a solution with a lower SER. On the other hand, if , we have to choose so that satisfies the power constraint. Thus, we consider this case. Otherwise the updated solution cannot satisfy the power constraint. This scenario is also evident from Figure 8. Thus, the step-size for gradient descent must be chosen sufficiently small, in order to ensure the convergence (however, an overly small step-size results in slow speed of convergence). In Figure 8, and are the two candidate solutions for the updated precoder , corresponding to the roots of the quadratic (28). The desired solution is (corresponding to the smaller ), which ensures the convergence of the gradient descent algorithm. This can be seen form the fact that , which corresponds to the larger , will be opposite to closer to the convergence point, where . where we use the fact that [30, Theorem 3.1]. From this, the result in (34) follows. Under this condition, MSER precoder maximizes subject to , where . Now, from [31, Lemma 2.2], it directly follows that the MSER precoder is a scaled identity matrix and hence the result in (38). and hence , that is, the objective function (25) is unchanged by a unitary transformation of . Next, consider the singular value decomposition (SVD) of , where and are unitary matrices and is a diagonal matrix of singular values of . If has identical elements, then it has rank one and hence only a single nonzero singular value , that is, . Therefore, it can be seen that has the form , where is a vector and is the matrix of zero elements. The authors wish to thank the reviewers and the editor for their insightful comments and suggestions which help improve the paper. This work was supported by the Research Council of Norway projects 176773/S10 (OptiMO) and 183311/S10 (M2M), under the VERDIKT program.